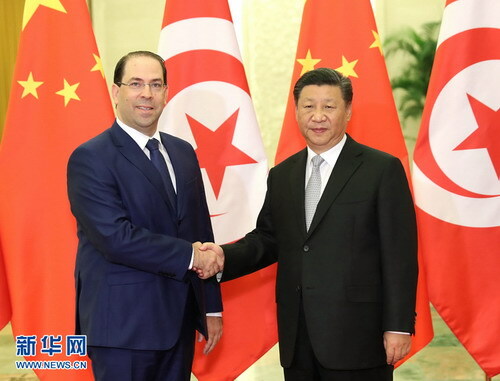 BEIJING, Sept. 5,Chinese President Xi Jinping on Wednesday met with Tunisian Prime Minister Youssef Chahed after the 2018 Beijing Summit of the Forum on China-Africa Cooperation. Xi said the friendship between China and Tunisia will remain unchanged no matter how the situation changes, and that the China-Tunisia relationship has maintained healthy and stable development. China will, as always, support Tunisia in exploring a development path suited to its national conditions and conforming to the trend of the times, and support Tunisia's efforts in maintaining stability and promoting economic and social development, Xi said. Xi also urged the two sides to increase interaction and strengthen exchanges of experience in governance. China is willing to work together with Tunisia to promote major projects and deepen cooperation in fields such as aerospace and tourism, adding that the two sides should join hands on major international and regional issues to safeguard the common interests of developing countries, Xi said. Chahed said the eight major initiatives proposed at the summit would elevate Africa-China relations to a new level. 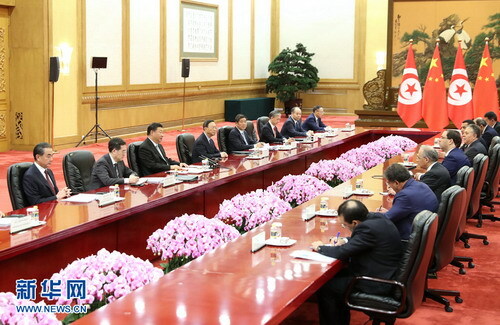 Tunisia applauds the concept of a China-Africa community with a shared future and the Belt and Road Initiative proposed by President Xi, and hopes to learn from China's success, strengthen cooperation in fields such as the economy and trade as well as tourism, and welcomes Chinese companies to invest in Tunisia, Chahed said.